I just finished my 2-week rotation on the Storytime Bus with a "Garden" theme. We talked about both flower gardens and vegetable gardens, and what we would like to plant if we had a garden. We also talked about how seeds need soil, water, and sunlight to grow, the main parts of the plant and what they do (roots, stem, leaves, flower), and what types of bugs and animals might be helpful or harmful to the garden. I particularly emphasized how important bees are for pollination, and that without pollination we would get no vegetables to eat, or seeds to plant more flowers. 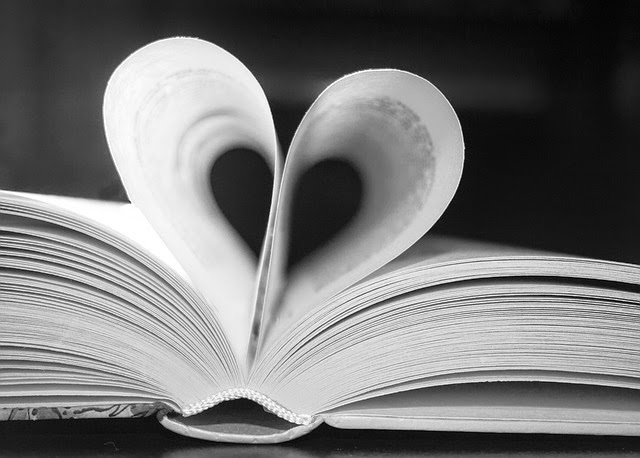 I used mostly the same books and the same songs and rhymes as I did last time, so I'll just link to my previous "Garden" post and highlight the three new books I used this time here. 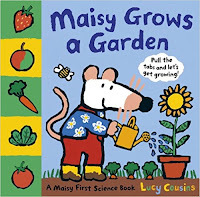 Maisy Grows a Garden is not actually a "new" book, but we did not have it in our collection previously, so it is new for me. I love these Maisy pull-tab books! They are short and simple enough for the younger kids, but all the pull-tabs and pop-ups keep the older ones engaged, too. This books shows all the steps of gardening: digging the ground, planting the seed, watering, sunlight, sprouting, weeding, growing, and maturing. I like that it shows both vegetables (carrots, lettuce, tomatoes, and green beans), and flowers. 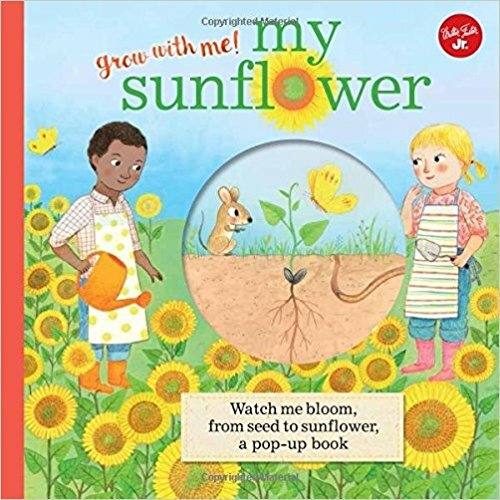 My Sunflower by Mar Ferrero and Martin Taylor is a new pop-up book that is also great for the younger ones because it is short and simple, but the older ones like the pop-ups, too. 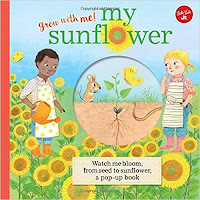 The first page amazes them because when the book is closed, you see a sunflower seedling in the die-cut circle, with the seed still visible and roots and shoot just started to develop. But then when you open the cover, it "magically" changes to a sunflower blossom in full bloom! We see the seed in the ground, then after it gets water and sunshine, the seed cracks open and the roots and shoot start to grow. The seedling grows taller and taller, then a bud appears, and finally blooms into a huge pop-up flower. 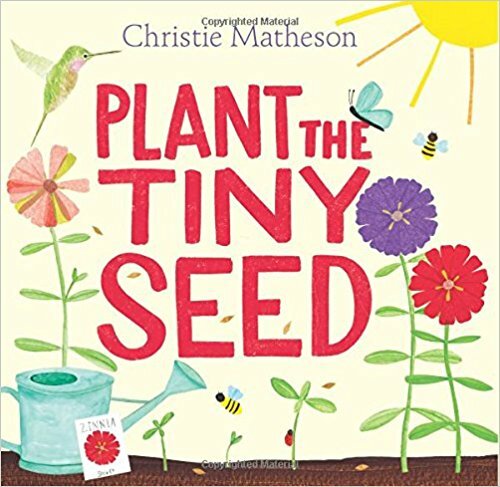 I love Christie Matheson's Tap the Magic Tree, so I was excited when her new book, Plant the Tiny Seed, came in a couple of months ago. 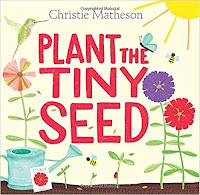 In this book, we follow the growth cycle of zinnia flowers, from seed to sprout to blossom and back to seed again. 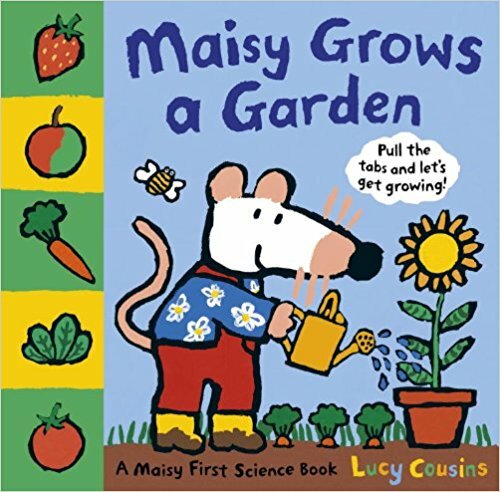 Just like her other books, the reader/audience is prompted to do various motions, such as making it rain, clapping to bring the sun, and pretending to snip the spent flower so more buds will bloom. I will say this book doesn't quite have the same magic as her first, but it's still nice to use. The kids all enjoyed this theme and talking about their gardens at home, or what they would want to grow in their gardens. One thing I noticed that was very consistent across all groups is that they were *really* distracted by any bugs or worms shown in the illustrations! I made a point to explain how some were good, such as how earthworms keep the soil loose, allow water and air to reach the roots, and fertilize the soil; how ladybugs eat the aphids, and how important bees are for fertilization. Of course we also read my two favorite garden-related books, Muncha! Muncha! Muncha! and Carrot Soup, along with several others. For more books and songs & rhymes, see my previous "Garden" post and my previous "Five Little Flowers" Flannel Friday post! Frogs, Toads, Aliens, and Dinosaurs!